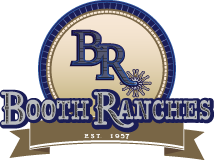 Booth Ranches is proud to present a great line up of mares, babies and show horses. The sire for each offspring has been carefully selected in hopes of producing the highest quality performance horses to represent Booth Ranches. Great pride, care and hard work go into each horse and we hope you will stop by and visit our great facilities. Loren Booth appreciates a good horse and loves the opportunity to ride one.